Lanxess confirmed the preliminary results of last year that was published on March 7, 2013. Group sales grew by 4% in fiscal 2012 to 9.094 billion euro, a record result for the German specialty chemicals company. “2012 was the best year in our growth story so far. Our business model proved itself once again,” said Lanxess’ Chairman of the Board of Management, Axel C Heitmann, at the Annual Press Conference. The Asia Pacific region again proved to be a stabilizing factor in 2012. Sales grew by about 10% to about 2.2 billion euro. In Greater China (Hong Kong, China, Taiwan), the 1 billion euro sales threshold was exceeded for the first time. Business in North America also gained strongly, with sales advancing by more than 10% to roughly 1.6 billion euro. The Europe excluding Germany, Middle East, Africa (EMEA) region, with sales of 2.5 billion euro, once again accounted for the largest share of LANXESS sales, although business in this region showed a slight decline of just under 1%. In Germany, sales rose slightly to approximately 1.6 billion euro. In the Brazil, Russia, India, China, South Africa (BRICS) countries, sales moved forward by 1% year-on-year to nearly 2.2 billion euro. Performance Polymers showed a solid performance and remained the largest segment in business terms, raising sales by more than 2% from the strong level of the prior year to some 5.2 billion euro. Sales of the Advanced Intermediates segment grew by more than 8% in 2012, to roughly 1.7 billion euro. Sales of the Performance Chemicals segment improved by more than 3% in 2012 to approximately 2.2 billion euro. In 2012, Lanxess had sales of approximately 1.6 billion euro with products and technologies for “Green Mobility”, which accounted for some 17% of overall sales. The company expects to achieve sales of some 2.7 billion euro in sales from “Green Mobility” by 2015. 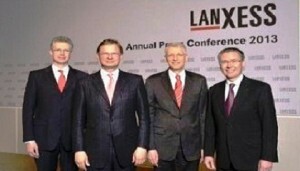 Lanxess also announced that the transfer of company headquarters to Cologne is proceeding on schedule. The new Group headquarters, Lanxess Tower, will be inaugurated on September 3. For the current year, Lanxess is again planning capital expenditures of some 650 million euro to 700 million euro. Research and development expenditures are expected to grow by about 10% in 2013 from 192 million euro in the previous year. Contrary to the usual seasonal trend, however, the low level of demand that was already apparent in the second half of 2012 has continued into the start of the year in most businesses. “Conditions may be more turbulent at the moment, but we remain optimistic thanks to our strategic set-up with a focus on the emerging markets and megatrends.” Said Mr Heitmann.